Remember that Christmas tea I got addicted to? I went to Wegmans and it was no longer there! I braved those aggressive customers and those carts clattering over the cobblestones only to stand bereft in the fancy tea aisle. At Wegmans they do not keep this Celestial Seasonings tea in the normal tea aisle. They are in the fancy tea section, back by the deli. I had to mail order this tea! I have never done this in my life, mail ordered anything you eat or drink. Sometimes you see it in cooking magazines. They will tell you to mail order something. And I always laughed at that. So... what I did, I ordered a six-pack of Sugar Plum Spice. That was the tea that turned out to be my favorite, after I bought it reluctantly thinking I probably would not like it. 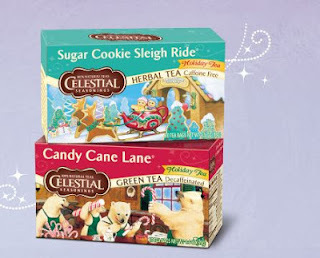 And a two-pack of the Candy Cane Lane peppermint green tea. That was another tea I bought reluctantly because I could not find the kind without the green tea. Now I find I cannot live without it. Hmmm, looking at the picture above, I realize I never got to try Sugar Cookie Sleigh Ride. That is probably great too! Anyway, my bill came to $21 including shipping which is not a small price to avoid a nervous breakdown. What is it with these crazy hippies over at Celestial Seasonings? Why do they bring out the good stuff only at Christmas? When I was looking for this tea the other day I saw all their other stuff, Red Zinger, True Blueberry, Morning Thunder, etc. Who drinks this stuff? Does anyone know anyone who knows anyone who drinks Red Zinger? I find myself rationing my Sugar Plum Spice until my shipment arrives. As I work to complete my Pennario project I am thinking I will have to thank it in the acknowledgments. I can't wait to stay home with my six-pack! I got into Celestial Seasonings tea last year when I had to go through a caffeine-withdrawal due to sickness. I also enjoy the Red Zinger tea as an afternoon or post-dinner tea. Julia, a few people on Facebook came forward too attesting to the yumminess of Red Zinger. I have changed my mind... I am definitely going to have to try it!